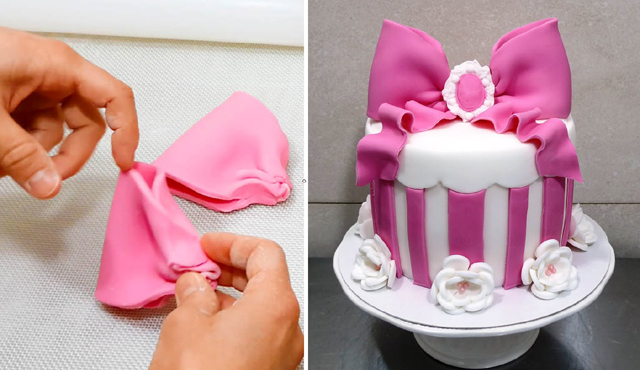 One interesting and festive cake designs for a party is to form the cake into a present shape complete with bows, streamers or wrapping paper imprinted fondant covering. You can give a gift and a cake at the same time! This is an old favorite which is gaining a great deal of popularity among the professional set of designers because it is quite simple but can be very creatively executed with a little thought and a few tools. Each element can be created separately and then assembled with little fuss. Cake: There is no limit on what shape the cake can be although square is obviously the traditional choice to mimic a box. Rectangle, round, hexagon and even heart shaped boxes are equally pretty but increasingly complex to cover for beginner designers. You can even stack several boxes on top of one another to create a stack of presents depending on the amount of cake required for the event. If you are really adventurous, you can even stack your presents as a topsy turvy cake. Different shaped boxes and complimentary boxes work with stacks, it is up to you which appeals to your senses. If you are stacking cakes it is important to follow all the foundation and construction rules recommended for cakes. You would not want your pretty pile of presents to collapse because dowels and cake boards were left out of the process. Wrapping Paper: There are quite a few options a cake decorator can use for this aspect of the design. Fondant is a logical choice to use for the paper because it is so versatile and is smooth like real wrapping paper. If you have a steady hand and creative skills in painting you can simply cover your cakes and then hand paint designs with a brush and food coloring. Stamps and cut outs can also be utilized for creating repeating designs on fondant for the wrapping paper. One very pretty and spectacular effect is created by using sugar sheets patterned with designs that already look like paper. Stripes, hearts, flowers, polka dots, animal prints and other patterns can be purchased easily at your local cake decorating store or online. Pattern the fondant before you cover your cake following the instructions on the product. Embossing mats can also make great raised patterns on the wrapping paper. Try using assorted techniques and designs if you are stacking your "boxes" for a casual event and stick with similar looking packages when creating a cake for a more elegant get together. Bows and Streamers: The bow on a present can take many forms from a traditional knot with two loops to a festive messy assortment of streamers. The look depends on your choice and taste. The bow can also feature ribbons extending all around the box on both sides or be pinned on top alone. Either look is pretty and can be easily created with a ruler and sharp cutting instrument. When you are making ribbons for the loops and accompanying side accents it is important to use a ruler and make the end result as close to real as possible. This type of cake design is very simple to make. Simple roll out the fondant or gum paste with a roller or pasta machine thinly and cut strips measuring with a ruler to ensure width is consistent. Brush the ends of the strip with gum paste adhesive or water and fold the strips in half forming a loop. To ensure your loops don't collapse use form to hold them apart until the gum paste or fondant has dried. Use two loops and two cut ribbons for a simple bow or combine several loops in a round construction to form a complex design. Use a dab of buttercream to secure all the loops together on top of your present cake. Streamers can be created in a similar manner using thinner width cut strips. Simple wrap the length of the strip around a dowel creating a spiral and allow it to dry. Then slide the streamer off the dowel. Use several of the same color or different colors to create what you want. Secure the various streamers with buttercream on top of the wrapped cake. Other Elements: You can finish your cake with a name card on top to add realism and have somewhere to write a message or more than one message! Roll out fondant or gum paste and cut square or rectangular pieces which you then can write on with edible pen or pipe your message using a small round tip. Secure the card to the top of your present cake with a little dab of icing.